I once had a friend after a long night of drinking consult me on his living room couch, “What does quantum mechanics really mean?” I was taken aback for this particular friend and I had never discussed physics—let alone quantum mechanics—in our entire five year relationship. He was a former UCSB frat boy and he was the friend I turned to when I needed a break from my intellectual studies to indulge in the simpler pleasures of life such as women and beer. He was also so heavily inebriated that I was pretty sure he wasn’t even going to remember asking the question in the morning (which I was indeed later proven right). I’ll be honest I was in shock for I had never heard my friend express this type of existential thinking before. Not to paint him one-sidedly, we had had many intelligent discussions on finances, the economy, politics, but never physics and philosophy. Maybe it had something to do with the marijuana joint I just passed to him. Anyways, after a few moments of contemplation I answered, “Everything from your smartphone to the latest advances in medicine, computer and materials technology, to the fact you’re changing channels on the TV with that remote in your hand is a result of understanding quantum mechanics. But you’re right; we still don’t fully understand it and it’s continually showing us that the universe is probably a place we’ll never fully grasp, but that doesn’t mean we should give up…” I then continued with what might’ve been too highbrow of an explanation of quantum mechanics for an extremely drunk person at 3 a.m. because halfway through he fell asleep. As my friend snored beside me, I couldn’t help but be bothered that he and so many others still considered quantum mechanics such an abstract thing more than a hundred years after its discovery. I thought if only I could ground it in some way to make people realize that they interact with quantum mechanics every day; that it really was rooted in reality and not a part of some abstract world only understood by physicists. I myself being a layperson with no university-level education in science learned to understand it with nothing more than some old physics books and free online classes. Granted it wasn’t easy and took a lot of work—work I’m still continuing, but it’s an extremely rewarding work because the more I understand, the more exciting and wonderful the world around me becomes. 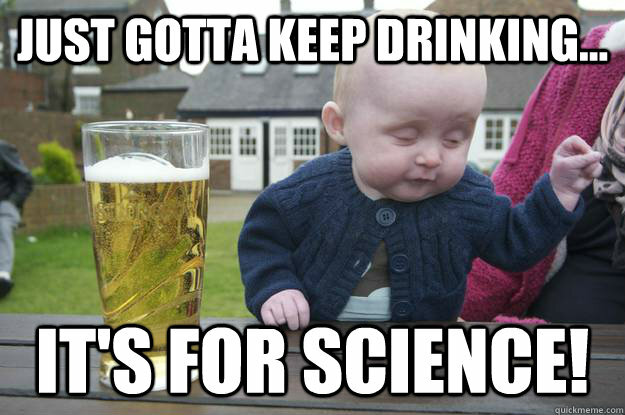 This was my inspiration behind The Party Trick Physicist blog; to teach others about the extraordinary world of science and physics in a format that drunk people at 3 a.m. might understand. I make no promises and do at times offer more in-depth posts, but I do my best. With this said, as unimaginative as a post about at-home physics experiments felt to me initially, there’s probably no better way to ground quantum mechanics—to even a drunk person at 3 a.m.—than some hands on experience. Below are four simple quantum mechanical experiments that anyone can do at home, or even at a party. For this experiment you’ll be building an easy to make spectroscope/ spectrograph to capture or photograph light spectra. For the step-by-step tutorial on how to build one click here. After following the instructions you should end up with, or see a partial emission spectrum like this one below. Now what exactly do these colored lines have to do with electrons? Detailed in a previous post, The Layman’s Guide to Quantum Mechanics- Part 2: Let’s Get Weird, they are electron footprints! You see, electrons can only occupy certain orbital paths within an atom and in order to move up to a higher orbital path, they need energy and they get it by absorbing light—but only the right portions of light. They need specific ranges of energy, or colors, to make these jumps. Then when they jump back down, they emit the light they absorbed and that’s what you’re seeing above; an emission spectrum. An emission spectrum is the specific energies, or colors an electron needs—in this case mercury electrons within the florescent light bulb—to make these orbital, or ‘quantum’ leaps. Every element has a unique emission spectrum and that’s how we identify the chemical composition of something, or know what faraway planets and stars are made of; just by looking at the light they emit. This is how you can replicate Thomas Young’s famous double slit experiment that definitively proved (for about 100 years) that light acts as a wave. All you need is a laser pointer, electrical tape, wire and scissors. Click here for a step-by-step video tutorial. This experiment is probably only for the most ambitious at-home physicists because it is the most labor and materials extensive. However this was the experiment that started it all; the one that gave birth to quantum mechanics and eventually led to our modern view of the subatomic world; that particles, whether they be of light or matter, act as both a wave and a particle. Explained in detail in my previous post The Layman’s Guide to Quantum Mechanics- Part I: The Beginning, this was the experiment that proved Einstein’s photoelectric effect theory, for which he won his only Nobel Prize. Click here to learn how to make your own photoelectric effect experiment. Good luck my fellow party trick physicists and until next time, stay curious. A great way to understand the continuous-wave and the quantized-particle duality of quantum physics is to look at the differences between today’s digital technology and its predecessor, analog technology. All analog means is that something is continuous and all digital means is that something is granular, or comes in identifiable chunks. For example the hand of an analog clock must sweep over every possible increment of time as it progresses; it’s continuous. But a digital clock, even if it’s displaying every increment down to milliseconds, has to change according to quantifiable bits of time; it’s granular. Analog recording equipment transfers entire, continuous sound waves to tape, while digital cuts up that signal into small, sloping steps so that it can fit into a file (and why many audiophiles will profess vinyl is always better). Digital cameras and televisions now produce pictures that instead of having a continuum of colors, have pixels and a finite number of colors. This granularity of the digital music we hear, the television we watch, or the pictures we browse online often goes unnoticed; they appear to be continuous to our eyes. Our physical reality is much the same. It appears to be continuous, but in fact went digital about 14 billion years ago. Space, time, energy and momentum are all granular and the only way we can see this granularity is through the eyes of quantum mechanics. Although the discovery of the wave-particle duality of light was shocking at the turn of the 20th century, things in the subatomic world—and the greater world for that matter, were about to get a whole lot stranger. While it was known at the time that protons were grouped within a central region of an atom, called the nucleus, and electrons were arranged at large distances outside the nucleus, scientists were stumped in trying to figure out a stable arrangement of the hydrogen atom, which consists of one proton and one electron. The reason being if the electron was stationary, it would fall into the nucleus since the opposite charges would cause them to attract. On the other hand, an electron couldn’t be orbiting the nucleus as circular motion requires consistent acceleration to keep the circling body (the electron) from flying away. Since the electron has charge, it would radiate light, or energy, when it is accelerated and the loss of that energy would cause the electron to go spiraling into the nucleus. In 1913, Niels Bohr proposed the first working model of the hydrogen atom. Borrowing from Max Planck’s solution to the UV catastrophe we mentioned previously, Bohr used energy quantization to partially solve the electron radiation catastrophe (not the actual name, just me having a fun play on words), or the model in which an orbiting electron goes spiraling into the nucleus due to energy loss. Just like the way in which a black body radiates energy in discrete values, so did the electron. These discrete values of energy radiation would therefore determine discrete orbits around the nucleus the electron was allowed to occupy. In lieu of experimental evidence we’ll soon get to, he decided to put aside the problem of an electron radiating away all its energy by just saying it didn’t happen. Instead he stated that an electron only radiated energy when it would jump from one orbit to another. So what was this strong evidence that made Niels Bohr so confident that these electron orbits really existed? Something called absorption and emission spectrums, which were discovered in the early 19th century and were used to identify chemical compounds of various materials, but had never been truly understood. When white light is shined upon an element, certain portions of that light are absorbed and also re-radiated, creating a spectral barcode, so to speak, for that element. By looking at what parts of the white light (or what frequencies) were absorbed and radiated, chemists can identify the chemical composition of something. This is how were able to tell what faraway planets and stars are made of by looking at the absorption lines in the light they radiate. 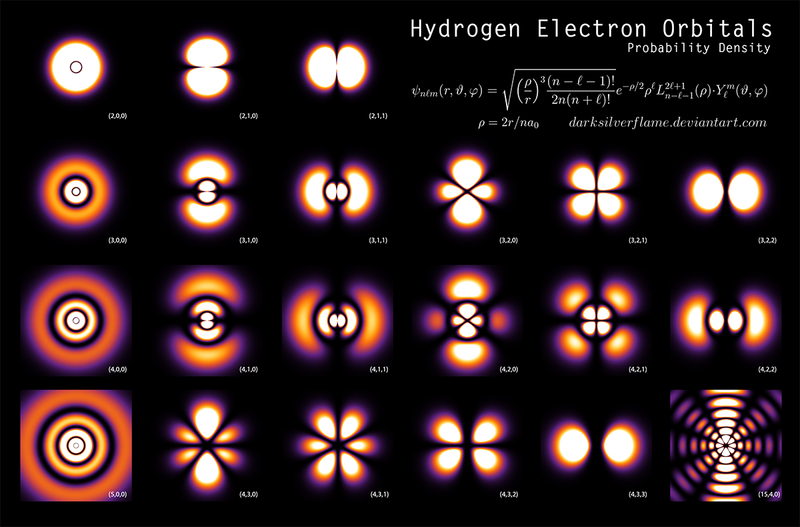 When the energy differences between these absorbed and emitted sections of light were analyzed, they agreed exactly to the energy differences between Bohr’s electron orbits in a hydrogen atom. Talk about the subatomic world coming out to smack you in the face! Every time light is shown upon an element, its electrons eat up this light and use the energy to jump up an orbit then spit it back out to jump down an orbit. When you are looking at the absorption, or emission spectrum of an element, you are literally looking at the footprints left behind by their electrons! Left- The coordinating energy differences between electron orbits and emitted and absorbed light frequencies. 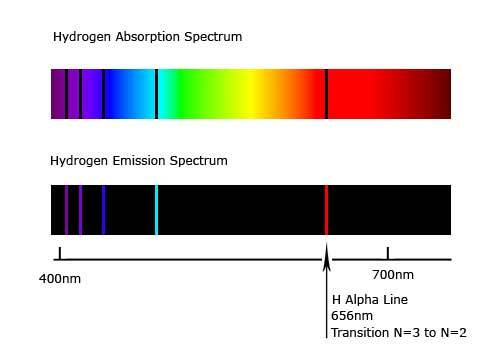 Right- A hydrogen absorption and emission spectrum. As always, this discovery only led to more questions. The quantum approached worked well in explaining the allowable electron orbits of hydrogen, but why were only those specific orbits allowed? In 1924 Louis de Broglie put forward sort of a ‘duh’ idea that would finally rip the lid off the can of worms quantum mechanics was becoming. As mentioned previously, Einstein and Planck had firmly established that light had characteristics of both a particle and a wave, so all de Broglie suggested was that matter particles, such as electrons and protons, could also exhibit this behavior. This was proven with the very experiment that had so definitively proven light as a wave, the now famous double slit experiment. It proved that an electron also exhibited properties of a wave—unless you actually observe that electron, then it begins acting like a particle again. To find out more about this experiment, watch this video here. As crazy as this all sounds, when the wave-like behavior of electrons was applied to Bohr’s atom, it answered many questions. First it meant that the allowed orbits had to be exact multiples of the wavelengths calculated for electrons. Orbits outside these multiples would produce interfering waves and basically cancel the electrons out of existence. The circumference of an electron orbit must equal its wavelength, or twice its wavelength, or three times its wavelength and so forth. Secondly if an electron is now also a wave, these orbits weren’t really orbits in the conventional sense, rather a standing wave that surrounded the nucleus entirely, making the exact position and momentum of the particle part of an electron impossible to determine at any given moment. This is where a physicist by the name of Werner Heisenberg (yes the same Heisenberg that inspired Walter White’s alter ego in Breaking Bad) stepped in. From de Broglie’s standing wave orbits, he postulated sort of the golden rule of quantum mechanics: the uncertainty principle. It stated the more precisely the position of an object is known, the less precisely the momentum is known and vice versa. Basically it meant that subatomic particles can exist in more than one place at a time, disappear and reappear in another place without existing in the intervening space—and yeah, it basically just took quantum mechanics to another level of strange. While this may be hard to wrap your head around, instead imagine wrapping a wavy line around the entire circumference of the earth. Now can you tell me a singular coordinate of where this wavy line is? Of course not, it’s a wavy line not a point. It touches numerous places at the same time. But what you can tell me is the speed in which this wavy line is orbiting the earth by analyzing how fast its crests and troughs are cycling. On the other hand, if we crumple this wavy line up into a ball—or into a point, you could now tell me the exact coordinates of where it is, but there are no longer any crests and troughs to judge its momentum. Hopefully this elucidates the conundrum these physicists felt in having something that is both a particle and a wave at the same time. So why exactly is quantum mechanics a very precise game of probability? Because when something is both a particle and wave it has the possibility to exist everywhere at every time. Simply, it just means a subatomic particle’s existence is wavy. The wave-like behavior of a particle is essentially a map of its existence. When the wave changes, so does the particle. And by wavy, this doesn’t mean random. Most of the time a particle will materialize into existence where the wave crests are at a maximum and avoid the areas where the wave troughs are at a minimum—again I emphasize most of the time. There’s nothing in the laws of physics saying it has to follow this rule. The equation that describes this motion and behavior of all things tiny is called a wave equation, developed by Erwin Schrödinger (who you may know him for his famous cat which I’ll get to soon). This equation not only correctly described the motion and behavior of particles within a hydrogen atom, but every element in the periodic table. Heisenberg did more than just put forth the uncertainty principle—he of course wrote an equation for it. This equation quantified the relationship between position and momentum. This equation combined with Schrodinger’s gives us a comprehensive image of the atom and the designated areas in which a particle can materialize into existence. Without getting too complex, let’s look at a simple hydrogen atom in its lowest energy state with one proton and one electron. Since the electron has a very tiny mass, it can occupy a comparatively large area of space. A proton however has a mass 200 times that of an electron and therefore can only occupy a very small area of space. The result is a tiny region in which the proton can materialize (the nucleus), surrounded by a much larger region in which the electron can materialize (the electron cloud). If you could draw a line graph that travels outward from the nucleus that represents the probability of finding the electron within its region, you’ll see it peaks right where the first electron orbit is located from the Bohr model of the hydrogen atom we mentioned earlier. The primary difference between this model and Bohr’s though, is an electron occupies a cloud, or shell, instead of a definitive orbit. Now this is a great picture of a hydrogen atom in its lowest energy state, but of course an atom is not always found in its lowest energy state. Just like there are multiple orbits allowed in the Bohr model, there higher energy states, or clouds, within a quantum mechanical hydrogen atom. And not all these clouds look like a symmetrical sphere like the first energy state. For example the second energy state can have a cloud that comes in two forms: one that is double spherical (one sphere inside a larger one) and the other is shaped like a dumbbell. For higher energy states, the electron clouds can start to look pretty outrageous. Left- Actual direct observations of a hydrogen atom changing energy states. Right- The many shapes of hydrogen electron clouds, or shells as they progress to higher energy states. Each shape is representative of the area in which an electron can be found. The highest probability areas are in violet. The way in which these electron clouds transform from one energy state to the next is also similar to the Bohr model. If a photon is absorbed by an atom, the energy state jumps up and if an atom emits a photon, it jumps down. The color of these absorbed and emitted photons determines how many energy states the electron has moved up or down. If you’ve thrown something into a campfire, or a Bunsen burner in chemistry class and seen the flames turn a strange color like green, pink, or blue, the electrons within the material of whatever you threw in the flames are changing energy states and the frequencies of those colors are reflective of how much energy the changes took. Again this explains in further detail what we are seeing when we look at absorption and emission spectrums. 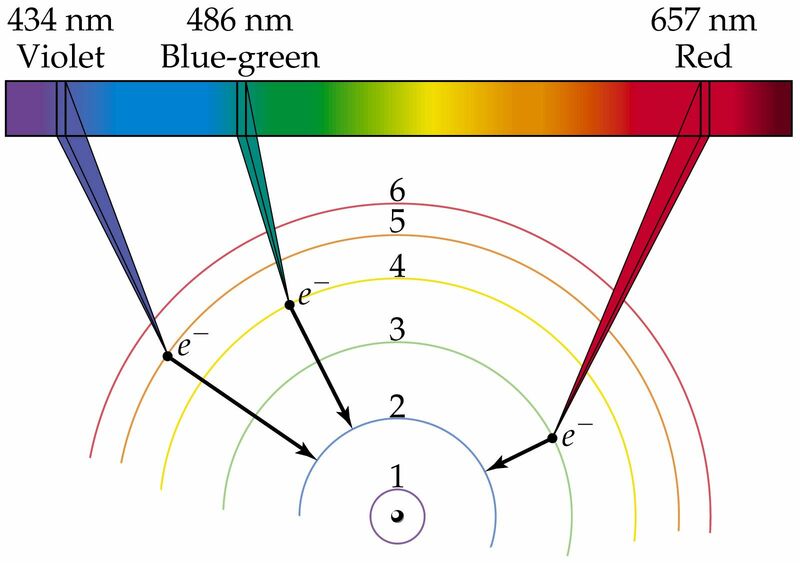 An absorption spectrum is all the colors in white light minus those colors that were absorbed by the element, and an emission spectrum contains only the colors that match the difference in energy between the electron energy states. Another important feature of the quantum mechanical atom, is that only two electrons can occupy each energy state, or electron cloud. This is because of something inherent within the electrons called spin. You can think of the electrons as spinning tops that can only spin in two ways, either upright or upside down. When these electrons spin, like the earth, they create a magnetic field and these fields have to be 180 degrees out of phase with each other to exist. So in the end, each electron cloud can only have two electrons; one with spin up and one with spin down. This is called the exclusion principle, created by Wolfgang Pauli. Spin is not something that is inherent in only electrons, but in all subatomic particles. Therefore this property is quantized as well according to the particle and all particles fall into one of two families defined by their spin. Particles that have spin equal to 1/2, 3/2, 5/2 (for an explanation on what these spin numbers mean, click here) and so on, form a family called fermions. Electrons, quarks, protons and neutrons all fall in this family. Particles with spin equal to 0, 1, 2, 3, and so on belong to a family called bosons, which include photons, gluons and the hypothetical graviton. Bosons, unlike fermions don’t have to obey the Pauli exclusion principle and all gather together in the lowest possible energy state. An example of this is a laser, which requires a large number of photons to all be in the same energy state at the same time. Since subatomic particles all look the same compared to one another and are constantly phasing in and out of existence, they can be pretty hard to keep track of. 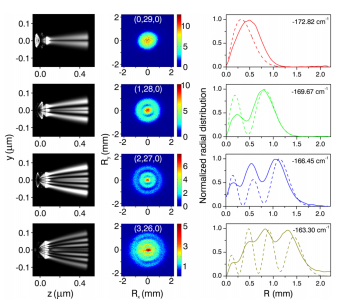 Spin however provides a way for physicists to distinguish the little guys from one another. Once they realized this though, they happened upon probably the strangest and most debated feature of quantum mechanics called quantum entanglement. To understand entanglement, let’s imagine two electrons happily existing together in the same electron cloud. As stated above, one is spinning upright and the other is spinning upside down. Because of their out of phase magnetic fields they can coexist in the same energy state, but this also means their properties, like spin, are dependent on one another. 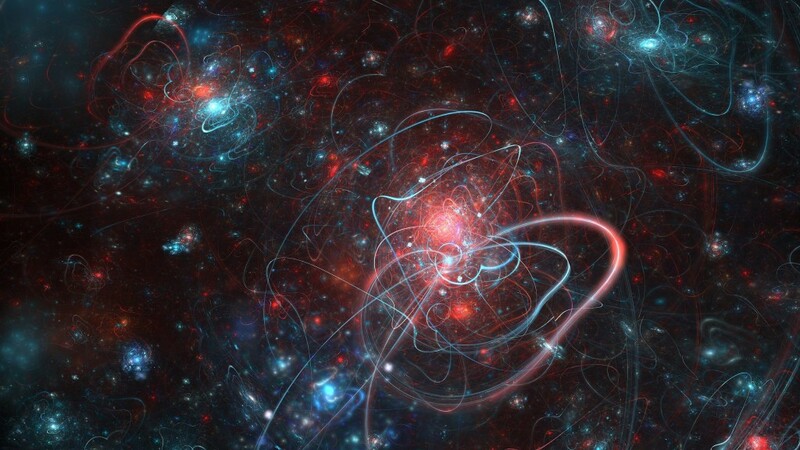 If electron A’s spin is up, electron B’s spin is down; they’ve become entangled. If say these two electrons are suddenly emitted from the atom simultaneously and travel in opposite directions, they are now flip-flopping between a state of being up and a state of being down. 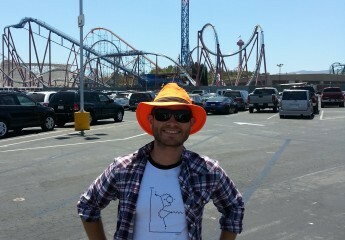 One could say they are in both states at the same time. 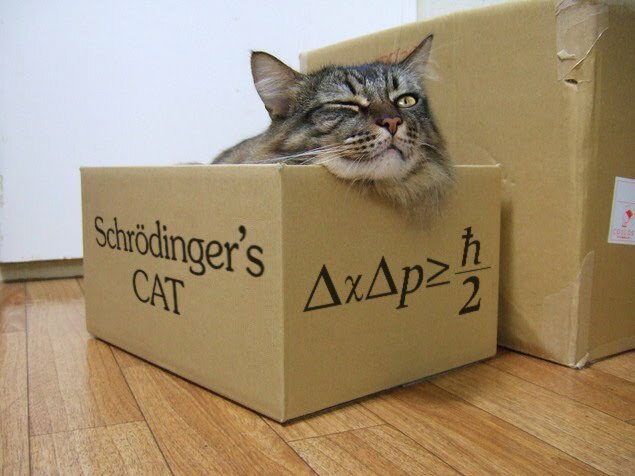 When Erwin Schrödinger was pondering this over and subsequently coined the term entanglement, he somewhat jokingly used a thought experiment about a cat in a box which was both in a state of being alive and being dead and it wasn’t until someone opened this box that the cat settled into one state or the other. This is exactly what happens to one of these electrons as soon as someone measures them (or observes them), the electron settles into a spin state of either up or down. Now here’s where it gets weird. As soon as this electron settles into its state, the other electron which was previously entangled with it, settles instantaneously into the opposite state, whether it’s right next to it or on the opposite side of the world. This ‘instantaneous’ emission of information from one electron to another defies the golden rule of relativity that states nothing can travel faster than the speed of light. Logic probably tells you that the two electrons never changed states to begin with and one was always in an up state and the other was always in a down. People on the other side of this debate would agree with you. However very recent experiments are proving the former scenario to be true and they’ve done these experiments with entangled electrons at over 100 km a part. Quantum entanglement is also playing an integral role in emerging technologies such as quantum computing, quantum cryptography and quantum teleportation. For as much as I use the words strange and weird to describe quantum mechanics, I actually want to dispel this perception. Labeling something as strange, or weird creates a frictional division that I’m personally uncomfortable with. In a field that seeks to find unity in the universe and a theory to prove it, I feel it’s counterintuitive to focus on strange differences. Just like someone else’s culture may seem strange to you at first, after some time of immersing yourself in it, you begin to see it’s not so strange after all; just a different way of operating. Quantum mechanics is much the same (give it some time I promise). We also have to remember that although reality within an atom may seem strange to us, it is in fact our reality that is strange—not the atom’s. Because without the atom, our reality would not exist. A way I like to put quantum mechanics in perspective is to think of what some vastly more macroscopic being, blindly probing into our reality might think of it. He/she/it would probably look at something like spacetime for example, the fabric from which our universe is constructed, and think it too exhibits some odd properties—some that are very similar to the wave-particle duality of the quantum world. While Einstein’s relativity has taught us that space and time are unquestioningly woven together into a singular, four dimensional entity, there’s an unquestionable duality just like we find in subatomic particles. Time exhibits a similar behavior to that of a wave in that it has a definite momentum, but no definable position (after all it exists everywhere). And space on the other hand has a definable, three dimensional position, but no definable momentum, yet both make up our singular experience of this universe. See if you look hard enough, both of our realities—the big and small, are indeed weird yet fascinating at the same time. Until next time my friends, stay curious.